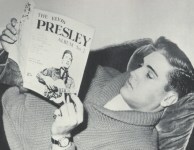 What's new(s) today for Elvis readers? With the internet a click away, news and internet pages come and go faster than I can type here. I therefore leave it up mostly to the reader to find the contents and reviews of books, while providing here just a starting point for old and new releases. My criteria for including books is that you should be able to turn over pages, not swipe through them. In this, I avoid references to digital releases (like the Amazon kindle stuff) on my site. But lately more and more dubious books surface which I also try to avoid including here. In a great article on The Elvis Information Network a list of such books is given.